I've had this print for a very long time. My late pen pal, Anne, gave it to me, possibly 10 years ago now. I was cleaning last year and found the tube it was in. It's an amazing print. If you can't read the legend, this is a map showing all the clans in Scotland during the reign of Robert the Bruce, 1314. 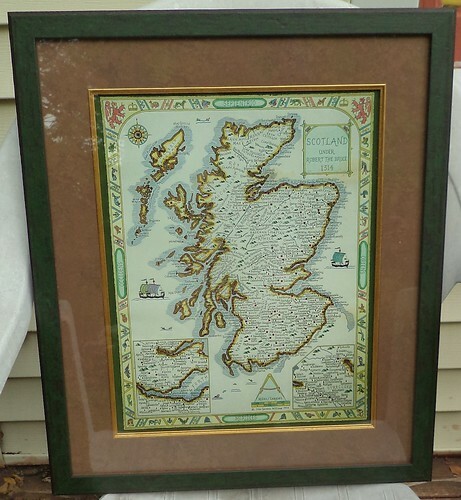 It's a reproduction of a map in the National Archives of Scotland. My particular branch of Clan Thomson is not on here. As far as the Thomson name goes, we started at the lower right, the southern edge, of Scotland. We were part of the "reivers", the men from Scotland who rode into England to steal cattle. I have not traced back beyond 1768, and, at that time, we lived northeast of Edinburgh, which is on the Firth of Forth, the indentation on the right side of the map, just a bit southwest of that viking long boat, For people like my family, tracing our ancestors back past the 1700's is going to be difficult. We're not royalty and there was really no reason to establish and hold bloodlines. The print was unrolled from its tube and placed on my ironing board. From mid-summer last year, through September of this year, the biggest books I could find rested on top of the print in an effort to flatten it further. When September rolled around, the print wasn't completely flat but the sale at JoAnn Fabrics for framing was too strong to resist. I am thrilled with the result. I had them put plastic as the "glass" because this is going to sit on the Clan Thom(p)son table at Highland Games. I didn't want someone to be horrified if they accidentally bumped it and it hit the ground. Likewise, I didn't want to have to clean up glass and risk damage to the print since I have not seen this anywhere to replace it. The addition of the gold trim on the inside makes the print pop. I wouldn't have thought of that on my own. The gal who framed it suggested it. It was worth the extra money. So, I need to clean the room where the litter boxes are, repaint the walls and hang this up. So much art that I'd love to have on the walls. This is too pretty to hide, but it's going to have to sit in the closet until I can get around to redoing that room. At least it can be appreciated by my clan at the next games.